1 . Enclosure is Dust, Vermin and waterproof made of FRP/ABS plastic with IP65 protection. 2. The terminals are connected with suitable copper wire. 3. Have proper cable gland for cable entry of appropriate sizes on both incoming and outgoing side. 4. HRC DC fuses are fitted to ensure early fault. 5. Reverse blocking diodes are provided with each string to safeguard reverse flow of current. 6. 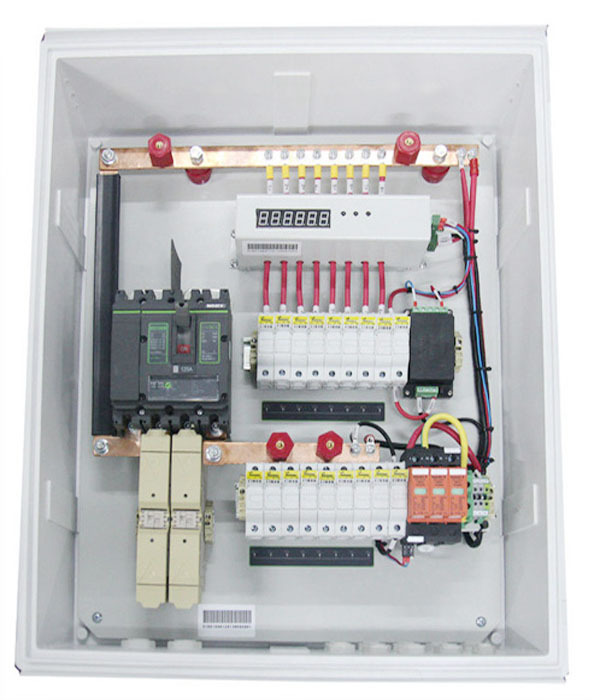 Surge protection device (SPD) or Metal oxide varistors (MOV) are provided for the surge protection. 7. Bus bar type end terminal connectors are provided to ensure there is no loose connection in o/p side. If MPPT is not capable of charging batteries then mains charger become active to charge the batteries and load is fed from mains. Once the batteries are fully charged load is automatically shifted to inverter operating on solar & batteries. Static PCU are available from 1 -1 5KVA, Single phase input and single phase output. Static PCU with peak grid demand are available on request.